It’s not all doom and gloom – there is another way and that is through Google Adwords Ad extensions. They’re reasonably well known, but they aren’t used nearly as much as they should. These little gems allow you to increase the description of what both your products and website has to offer to a potential customer. Adwords ad extensions come in a wide variety of shapes and sizes, which makes it pretty easy to find the ones to suit your business. They’re located in the ‘Ads & extensions’ tab in the new Adwords user interface. In there, you’ll find a whole host of Adwords ad extensions to better showcase your product offering. One of the most commonly used Adword ad extensions are sitelinks, chances are you have seen these already. Sitelinks show up just below your basic expanded text ad and direct users to particular a landing page on your site. You have the option of adding up to 8 sitelinks, of which 2-6 links will show at any one time for desktop and all 8 links on mobile or tablet, via the carousel format. Sitelinks are made up of 3 elements, a URL, a title and description. The description isn’t required, but it is an opportunity for you to pack more information into your ads, and give people a reason to click. This extension is like a reduced version of the sitelink extension. Unlike sitelinks you only have the ability to display a headline with 25 characters and there isn’t any option to link it back to your website. Imagine callouts like an enthusiastic salesman giving you all the unique selling points of your company in quick succession. You’ll want to make sure these are concrete and specific information detailing why your business is better than any other. 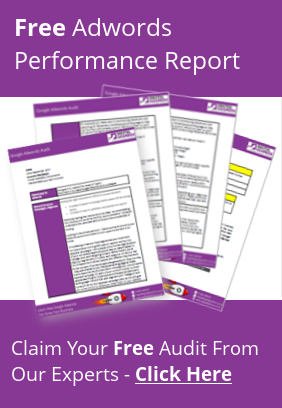 It could be that you offer next day delivery, or you’re the market leader of your industry. Whatever makes you stand out from the crowd – this is where you should be telling people those key points. Done well, they should fit really nicely up next to your text ad and are a great way to increase your message, keeping with the original ad format. Fairly similar to Callouts, structured snippets allow you to highlight specific aspects of your services or products you sell. You decide what type of information your customers might find valuable and populate lists with predefined headers, such as product or service category. Structured snippets help customers find out more about your products and services directly from your ad. By adding a preview of your product range, customers who click through should have higher intent to buy due to their knowledge. Call extensions have been around for a while now and are one of the many innovations in PPC geared directly towards mobile. A simple press of the call extension will lead you directly into a call with someone in the business who can help. One of our favourite features about call extensions is the ability to track how many people click this extension and track the usage as a conversion. call extensions can help lift your CTR by nearly 8% and allow customers to quickly get on conversation with you. Worried about people trying to call you after hours? There’s no need to, as you get to choose when to utilise this extension by setting them to only display during business hours . 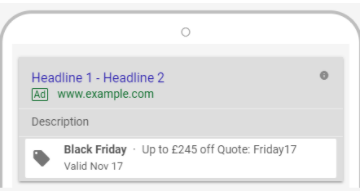 One of Google’s latest additions to the Adwords ad extension repertoire is Message Extensions, which provide a text message alternative to the call extension. Message extensions like other extensions display alongside your ad, allowing customers to click through and start messaging you instantly. You can chose to have a prewritten text sent out to people who interact this way or take full control yourself. Message extensions allow you to once again take up more advertising space, help improve your communication routes to your potential clients and can improve your CTR by 7%. 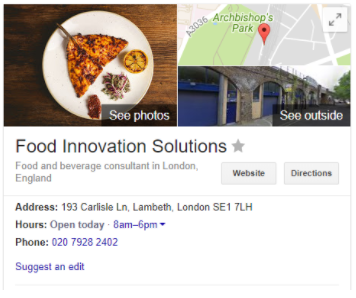 When a user searches for your business Google Maps will provide a map screenshot showing users where they can find you. Location extensions make it easier for your customers to call, discover the distance from you and get directions directly to your business. In order to be able to use location extensions you need to have firstly set up your company’s Google My Business listing. Location extensions are essential if your business has a physical storefront and you’re looking to drive foot traffic up. They are also very worthwhile if you are wanting to focus on attract more local custom. Using Google My Business you are able to label and filter each store location ensuring you are displaying the correct location to customers. As with all extensions they can help you by allowing you gain more ad space on the search results page. Let’s face it – you’re great, but what use is that if people don’t know? Adding in review extensions allows you to showcase just how great you are. With review extensions you’re able to share positive write-ups, awards or third party rankings, giving potential customers one more reason to click your ad. Some users have found that they can get a 66% increase CTR by adopting review extensions. This is great extension for any company who distributes their product to another store to sell. Affiliate location extensions allows advertisers to feature addresses of nearby national chains that stock their product. 76% of consumers conduct local searches on their phones before visiting a store on the same day. It has the chance to make a big impact on brands who sell their good through other stores, as it has the ability to provide online searchers with the kind of local experience directly on the Search Engine Results Page (SERP). Price extensions are ideal for the ecommerce world. This extension allows you to showcase your products and services, with the price next to them. What is so great about price extensions is that they should reduce your irrelevant clicks, which in turn saves your money and should improve your conversion rates. Each product can go off to it’s own landing page, making the amount of clicks needed for a user to convert lower and therefore more likely to convert. This is only useful if you have an app that you want to push. App extensions can help you increase the number of downloads you receive, as they can allow customers to either click through to your site or download your app directly from their associated app store. For those with apps, it is a great extension as it allows you to showcase your app and product simultaneously, allowing users to get to their intended location quickly. It’s also worth noting that you’re able to target specific devices, so can set it up to only show on mobile instead of tablet or only for Apple instead of Android if your app is developed with a more specific audience in mind. For years marketers have had to try to build in promotions into their main ad copy, which was frankly annoying as they took up too many valuable characters from your main messaging, and to top it off had the additional annoyance of having to spend the time to redo all the ads at the end of the promotion. Google’s latest addition to the extensions family, promotion extensions, solved this problem for us all. Now you are able to display a noticeable price tag icon beneath your ad, which highlights the promotion that you are currently running. They are particularly helpful for holiday events like Black Friday, Cyber Monday and Christmas, and all they require to be set up is a working promo code that people can use at the checkout and an end date you would like enforced for the promotion. Currently promotion extensions are out performing both sitelink and price extensions in terms of CTR with a 10% increase on normal ads. CTR isn’t the only thing that promotion ads help with however, as they can also improve your relevancy, by highlighting holidays like Black Friday and therefore can increase your quality score. Adwords ad extensions are there to help protect and improve your conversion rates. Like with Google Shopping Campaigns they allow users to gain more knowledge about your company, without needing to click anywhere. It should help with pre-qualifying your paid traffic as by putting more information in your ads, you can detract customers who are looking for something you don’t offer, reducing wasted spend. Plus it should also help with increasing clicks from the right people who might click on your ad over your competitors as you are telling them more about your offering. Not only do they cut the amount of clicks users have to go through in order to reach their intended purpose, you have more characters to play around with in your ad creation, giving you much more power to describe your product and service offerings and most importantly take more advertising space on the SERP. For the time it takes to set up extensions and the rewards they can provide, it isn’t a matter of ‘should we’ implement them, but ‘which ones’ should we implement.